Woohoo! 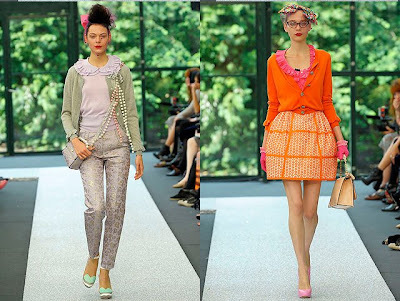 There's nothing on this planet more adorable than these Luella SS 09 outfits. I mean, look! Luella Bartley: "I wanted it to be a proper, ladylike character—but a bit psychedelic. And I wanted color, but in a sort of sick way. When I saw it all lined up, I thought, Ew! Can we do this?" This is sick all right! After the SS 08 geek-themed collection, the fash world had all eyes on the next creations. The concept of faux-pass is erased and now anything is possible. An easy going, decadent style. The color palette is totally ravishing. I love the Luella spirit even more than before. This collection seems to be very close, in terms of inspiration, to Betsey Johnson. At least in my mind. I can only relate to her for terms of comparison. But at Luella, the skirts are mini, and addorably ruffled. Pattern clash, lots and lots of necklaces, extravagant headgear. Oh, and those shoes. I'm not even going to say more about those. I'd sure love me some heart decorated shoes or platforms. In pastel colors. Please?